Noord-Hollands archief, the official provincial archive of Noord-Holland. They also have the archives of the city of Haarlem. Address: Postbus 3006, 2001 DA Haarlem, The Netherlands. Phone: +31 23 5172700. E-mail: info@noord-hollandsarchief.nl. Stadsarchief Amsterdam, the municipal archive of Amsterdam. Address: Postbus 51140, 1007 EC Amsterdam, The Netherlands. Phone: +31 20 2511511. E-mail: informatie@stadsarchief.amsterdam.nl. Historische Vereniging Holland (Historical Society Holland) is the historical society for the provinces Noord-Holland and Zuid-Holland. The main historical society for Amsterdam is Amstelodamum. Ons Voorgeslacht (Our Ancestry) is the genealogy society for the provinces Noord-Holland and Zuid-Holland. Internet resources Noord-Holland, an index to the many available online resources for Noord-Holland. Amsterdam databases, including an index to the baptism church books. Covers the period 1564-1811. Noordhollandse Huwelijken (Noord-Holland marriages), family reconstructions based on marriage acts and other sources for many towns in Noord-Holland. 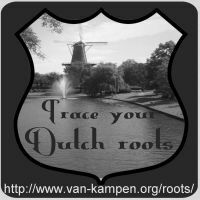 FamilySearch, the website of the LDS (Mormons) has many Noord-Holland records and scans. Beeldbank Noord-Holland (Image database Noord-Holland). In Dutch. Beeldbank Amsterdam (Image database Amsterdam), the image collection of the Amsterdam City Archive. In Dutch. The provincial archive of Noord-Holland is also present on YouTube. Graftombe. Register to order photos of tombs. Het Grafstenen project Noord-Holland (The tomb stone project Noord-Holland). Online Begraafplaatsen (Online Cemeteries) has images of tombstones of several cemeteries in Noord-Holland.